Born in 1943, Dr. Michael S. Coffman received his BS in Forestry and MS in Biology at Northern Arizona University and his Ph.D. in Forest Science at the University of Idaho at Moscow. Since then he has become a respected scientist and ecologist who was involved in ecosystem research for over twenty years in both academia and industry. He also assisted the U.S. Forest Service in developing an Ecological Land Classification System for each of the National Forests in Region-9. Dr. Coffman is currently President of Environmental Perspectives, Inc. (EPI), and Executive Director of Sovereignty International. EPI focuses on providing professional guidance and training in defining environmental problems and solutions based on Judeo-Christian principles of stewardship as contrasted with pantheistically-based environmentalism. He is also the author of several books. In this program, Michael discusses his research and themes from his film, "Global Warming or Global Governance?." 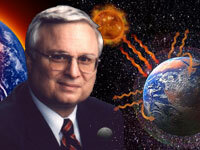 He discusses the science of global warming and the agenda of global governance. In the film, Michael provides evidence that the global warming agenda is being funded with tens of billions of dollars as a mechanism to create global governance. Hear from congressmen, experts and even well-known news broadcasters how global governance puts global institutions, especially the United Nations (UN), that are not accountable to the American people in control of every aspect of our economy. The skyrocketing gas and food prices today are a direct result of this agenda. Topics Discussed: the agenda of global warming, UN and the IPCC, ice core samples and the graphs, temperature drives CO2, what drives temperature, the sun, cosmic radiation, clouds, global cooling, water vapor, rain, Greenland ice and the WWII planes, the limitation of computer models, volcanoes and much more. For our members Michael goes deeper into the connections between global warming and global governance. We also discuss new technology, GMO and depopulation. More Topic Discussed: EPA, the IPCC and the UN, legally bypassing a nations sovereignty, oil prices and abiotic oil, new technology and energy, food, control, depopulation, terminator seed technology, GMO, Al Gore, Nobel Peace Prize, weather manipulation, HAARP, education and much more.